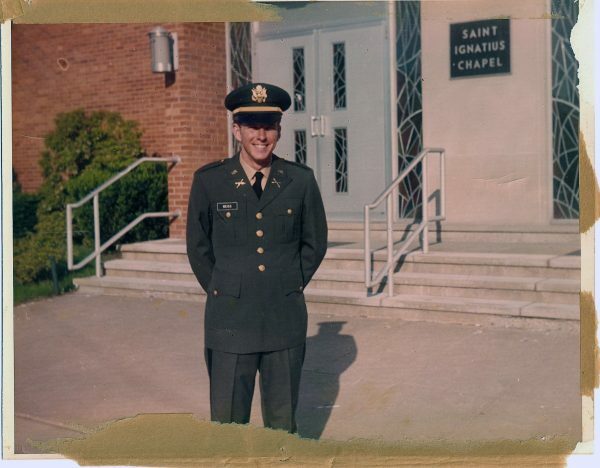 Every Veteran’s Day I am reminded of my time in service in the US Army. 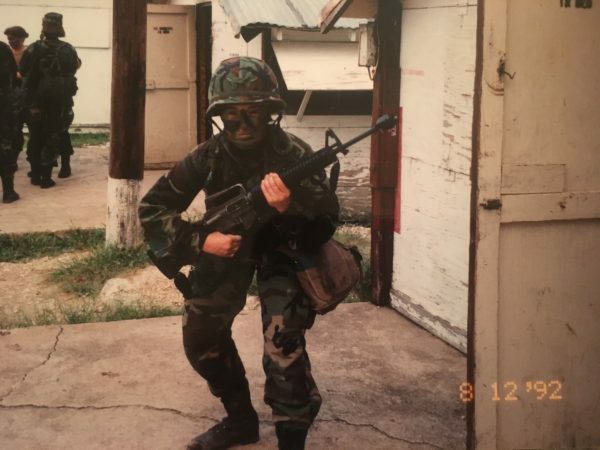 Most of my friends don’t even know that I served, and some are even shocked when they see a picture of me in my BDUs (Battle Dress Uniform) in full camouflage makeup, holding an M-16 rifle! Going into the military was no surprise to my family though… my father started off his military career in the Marine Corps but only lasted a couple days, then he went into the Navy and was sent to Vietnam in 1968-69 working in radio communications (he met and married my mom over there – she was a translator and also the desk clerk at their quarters!). After Vietnam he trained to become an engineer aboard aircraft carriers and would go out to sea for several months. In 1981 he used the GI Bill to go to school for nursing and branch-transferred into the Army Nurse Corps, then retired in 1992. 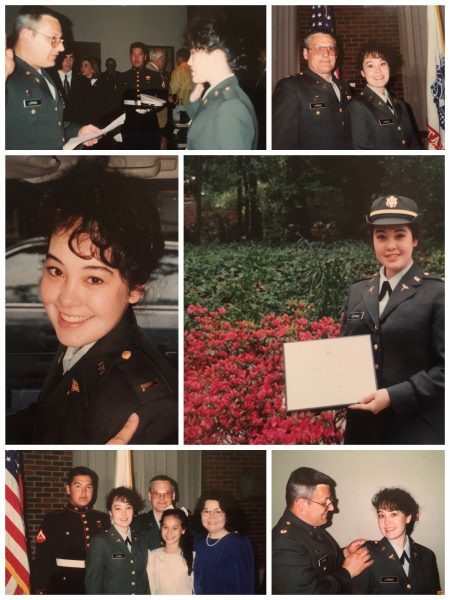 Since I grew up as a “military brat”, we moved frequently throughout the United States due to my dad’s assignments and training courses – I lived in 10 different places by the time I was thirteen! My dad’s father was a retired Army Quartermaster Officer who served in WWII and the Korean War, my brother was in the Marine Corps Reserves, my husband (whom I met in Army ROTC at Penn State) was an Army Field Artillery Officer, and his father graduated from West Point in 1965 and was sent to fight in the Vietnam War along with many of his classmates. THANK YOU to all those who have served in the past and the present- we are all grateful for your service! I was stationed at Ft Knox, KY and Ft Gordon, GA. I was a Stevedore, but never saw a ship! One of the jobs I had was to shovel coal to heat the barracks. In training I received the High Marksman award. I joined to serve my country and to pay for my education. I was very fortunate to have served 20 years without seeing combat. My highlights were being able to travel and live in some amazing places. I spent 6 years in Germany, and one year in Korea. I also served in Oklahoma, California, Massachusetts, and Pennsylvania. It was a very challenging and fulfilling career. An Interesting Fact: Rick was Audrey’s husband’s Army ROTC instructor at the Penn State Ogontz/Abington branch campus from 1988-1990! The tears streaming down my face as I humbly try to pay tribute to my hero are no match to the physical and emotional pain my dad, John W. Pazdan, suffered as a witness to the horrors of WWII. Enlisted in the US Army when he was just 18 years old, he was assigned to the European Theater in 1943. As a member of the 53/54 Replacement Battalion he served as a crew member of a Sherman M4-A1 medium tank and engaged in battle in Belgium at the Battle of the Bulge. During this conflict, his tank was struck and completely destroyed. He was ejected from the tank and lay unconscious for 24 hours in sub-freezing weather. The entire tank crew was killed. After his rescue, he finished out his term of service for ten months in a hospital bed at Rhoads General Hospital in Utica, New York. 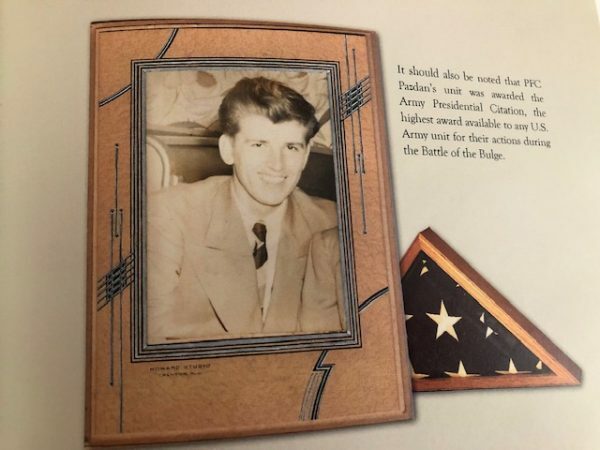 Like so many of the servicemen and women of “The Greatest Generation,” he never shared any of these details with our family. I can only surmise that his courage and bravery to protect his country when he was a young man extended to protect his four children from knowing the atrocities of war. I joined the Reserves during the Vietnam era. Did not leave the US however; was in Louisiana and Texas. Most impacting memory was working as a Medic in the Valley Forge Hospital in PA where all the Amputee Soldiers returned for medical treatments. I come from a family with a lot of military veterans. Several uncles and great uncles in the Navy and Army and one in the Air Force. Unfortunately, most of them have passed and I don’t know their stories, but I still have the letters that my grandfather and father sent back home to my grandmother while they served in the Army and Navy, respectively, mostly reassuring her not to worry about them. My grandmother worried about everyone, all the time, and never gave up on that intense love. My father was stationed on a naval ship in Norfolk, Virginia at the time of the Vietnam War, but he was never sent anywhere else aside from a brief stint in Panama. My mother grew up in Norfolk and had several friends in the Navy – she met my father through one of their mutual friends while he was stationed there. He was medically discharged because of a serious illness before he served his full 4 years and returned home to North Jersey. The illness almost killed him, but my grandmother nursed him back to health with beef blood juice and a few other concoctions. My mother drove up almost every weekend, from Virginia, by herself, to visit him. My grandmother thought she was crazy, that no woman should be driving that distance alone to see a man, but my mother quickly grew on her and became the daughter she always wanted. His father served in the Army during World War II and was stationed in several places throughout Europe. 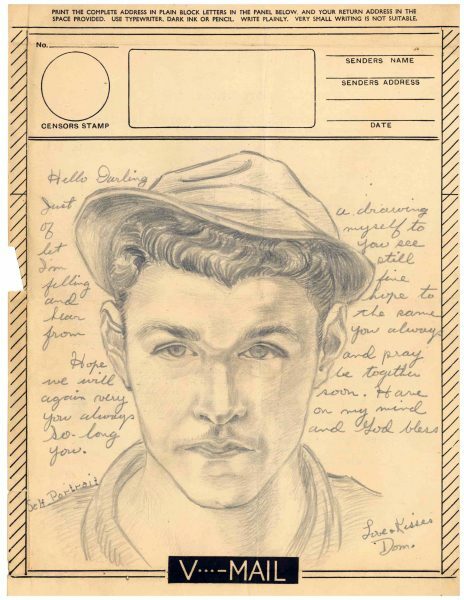 Most of the letters he wrote back home to my grandmother, his fiancé at the time, were to tell her not to worry about him; alerting her when he was going to be on the move and unable to write and reassuring her of his love, and… sometimes gently scolding her for getting upset anyway after not hearing from him. I wish I had the letters she wrote. While he was stationed overseas, his mother and family kept a close watch on her – escorting her everywhere and making sure she wasn’t left alone too much. They cared about her, but she said mostly they were afraid that she would change her mind before my grandfather got back and find someone else. They were married over 60 years before my grandfather passed in 2008. In addition to those precious letters, I still have some of the items he brought back from WWII including a dress sword, some coins, and several medals he earned. He never talked about his experience. I’m honored to have had so many brave men in my family. Did you know? 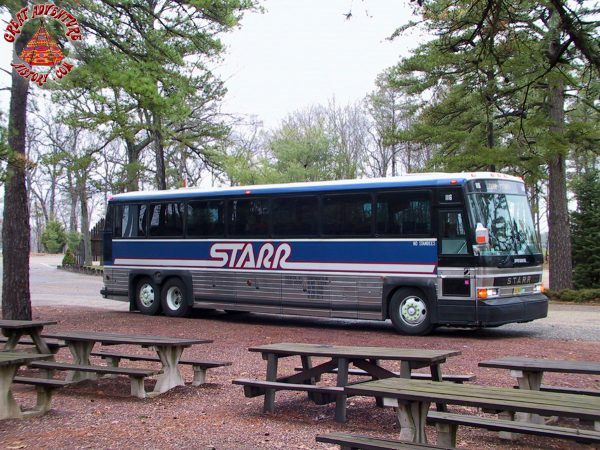 Starr offers a 5% discount on all motorcoach trips, all year long to any and all US Veterans! Starr values our veterans, and would like to formally salute anyone who has risked their lives for our country. Our annual Cross Country trip returned last week! Starr Driver Hank Lyde and Tour Director Gene Gray led 32 travelers across our great country over the course of 26 days. On each of our trips, the Starr Tour Director is responsible for providing a write up of everything that goes wrong, and right, while on the road. Gene goes above and beyond to make sure his passengers are well informed, and entertained, and even manages to keep those of us stuck in the office entertained with his Tour Director report, which does not disappoint. Like last year, Gene’s report is a fun and vivid retelling of their adventures. For your reading pleasure, here are Days 1-15. Stay tuned for the second half of their amazing “Journey of a Lifetime” this Friday! Off we go! After spending hours preparing tour bus #206 for this special trip, Starr Driver Hank Lyde and I motored out of the Starr lot on this late summer morning and over to the Hamilton AMC to pick up our first group of customers. On every seat was a folder with lots of information inside – information that I had spent hours (no, days) preparing for these deserving tour guests. Starr’s Vice President, Sandy Borowsky, met us at the Bensalem departure location laden with snacks and to wish us all a fond farewell. The passengers were all eager to get going and extremely enthusiastic to begin our journey across this great country. We have 6 military veterans on board and we honored them by playing the Armed Forces Medley. Passengers applauded proudly for each Veteran. Our group is made up of 11 males and 23 females (including Hank and I). We had siblings, couples, friends, widowers and solo travelers aboard. And everyone was looking to have the time of their lives! Just after we pulled out, I got to work! First, I sent a piece of paper around the bus asking passengers to write down any birthdays, anniversaries, or celebrations they were having during the month for which they wanted to be acknowledged. Next, I proceeded to play some Patriotic tunes to set the mood for the trip. I also honored one couple celebrating their 50th Anniversary by giving each other this trip as their wedding present with their wedding song, “Til” by the Angels. Thankfully I get lots of itunes gift cards for the holidays! I also provided ample and important “down time” for passengers to doze, read, or do their own thing. Before we knew it, our rest stop had come and gone and we arrived at our lunch stop. After lunch, I took the microphone and began to review my 28 page Cross Country booklet along with the other papers I had collated into every passenger’s Starr folder. It wasn’t too early to discuss possible strategies in both Las Vegas and San Francisco. I wanted them to begin the process of planning their time in both cities and I was pleased that many questions were asked. It was now time for our first movie of the trip. Since we were all completing some items on our bucket lists by taking this trip, I chose “The Bucket List” starring Jack Nicholson and Morgan Freeman. This was a big hit and enjoyed by everyone. After the movie, I overheard many people discussing their bucket list items and what they wanted to accomplish during this trip. We completed our first day of travel by pulling into the Drury Inn in Dublin, Ohio fifteen minutes ahead of schedule. Hank did a magnificent job of driving. The staff at the Drury Inn was friendly, courteous, and efficient. I was handed the keys immediately and was able to give them to the waiting passengers on the bus within minutes. This gave everyone a chance to go up to their rooms, drop off their belongings, and enjoy the Kickback without rushing. The Kickback offered free pasta, hot dogs, baked potatoes, and tortillas along with drinks. It was a great way to relax with the passengers and talk after a long day of travel. By the time everyone had finished eating (and some took a walk to a nearby restaurant for dinner or to the mall), the luggage had been delivered to each room. It was a perfect start to a fabulous vacation. Breakfast was plentiful thanks to the Drury staff. We departed on time and continued West on I-70 towards St. Louis. I played a few songs on the bus, discussed the history of St. Louis, and showed a video from the History Channel on the making of the St. Louis Arch. Soon, we reached our lunch stop at Bob Evans in Indianapolis, Indiana. Lunch was delicious and enjoyed by all. Many were still full from breakfast and only ate lightly. Nevertheless, the staff was extremely efficient and friendly and we were on our way within an hour and a quarter. I played a few more songs on the bus and showed a 30 minute video on Louis and Clark’s Journey to the Pacific Ocean in 1804. After one more rest stop at the Illinois Welcome Center (where we all turned our watches back one hour), we made excellent time into St. Louis arriving a half hour ahead of schedule. I had called the Drury Plaza to inform them of our earlier arrival and they were ready with our keys and our porter service. 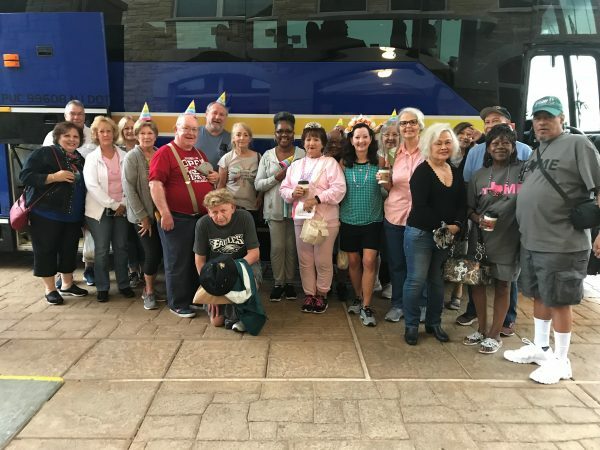 The passengers had a good half hour to go to their rooms, get settled, and freshen up before 29 out of 32 of us boarded the Trolley for an optional fun tour of St. Louis. We got the same St. Louis tour guide as last year! We stopped at the breathtaking Cathedral Basilica of Saint Louis and took pictures both inside and out. We also stopped at the huge and impressive statue of King Louis IX of France, the King who gave land charters to the first inhabitants of St. Louis, and for whom the city is named. And our guide was kind enough to do a drop off at the famous restaurant, Sweetie Pies, a soul food themed restaurant started by Robbie Montgomery. Miss Robbie, prior to opening up her chain of three restaurants, was a back up singer to several musical artists such as Ike and Tina Turner, the Supremes, Stevie Wonder, James Brown, and Patti LaBelle. A collapsed lung shortened her singing career and she turned to the restaurant business, which was very difficult for a black woman in the 60s. Those that went, all enjoyed their experiences at Sweetie Pies, and checked off a bucket list item. All in all, we all enjoyed the afternoon. I am happy to see that many passengers are working to follow through on their own bucket list items and I assist them in fulfilling their wishes whenever possible. Once we disembarked from the Trolley, two of our passengers accompanied me to the St. Louis Arch to pick up our tickets for tomorrow morning. 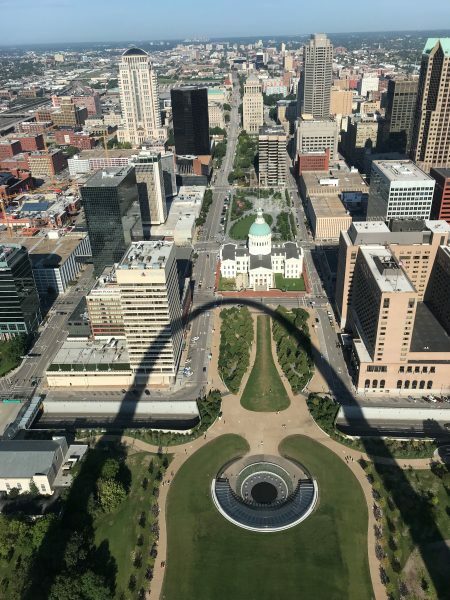 The vast construction that plagued the area surrounding the Arch last year was completed and the Arch was reopened on July 3, 2018. The landscape and new entrance to the Arch was beautifully done. The Arch looks more magnificent than ever. It had taken seven years to complete the construction. Many of our passengers took long walks around the city, following the map I provided, and enjoyed the city’s amenities. Others attended the Kickback in the Drury Plaza and called it a night. Carmen, Donna, and I proceeded to walk from the Arch to Busch Stadium, home of the St. Louis Cardinals, and the Ballpark Village that features restaurants and shops. The Cardinals had just lost a tough game in extra innings to the Cincinnati Reds, so all the fans wearing Cardinals gear were a bit subdued. We chose a restaurant, were seated immediately (I did ask whether they served Yankees fans and Carmen asked if they served Phillies fans to which the host replied with a big smile that they serve all fans). Dinner and conversation were wonderful. Following dinner, we walked back to the Arch to view it after nightfall. It was spectacular as shimmering lights reflected off of it from different angles. We strolled back to the Drury Plaza (one block away) and said good night, closing out a perfect Day Two. Again, breakfast was enjoyed by everyone. We all assembled a little before 8:00 AM to walk the one block to the St. Louis Arch. The cloudless sky was a deep blue. After a pleasant 5 minute walk, we had entered the newly completed entrance and were going through strict security. Belts came off, pockets were emptied, and bags were searched before we had to raise our arms up over our heads and saunter through the x-ray machine. One of our tour guests with about six pockets throughout his short pants was asked to go through the machine 5 times before he managed to empty all his pockets! Once through security, we met a Park Ranger who proudly introduced the spanking new Museum to us that also opened on July 3, 2018. She encouraged us to spend some time in the Museum after our trip to the top and we did just that. The trip to the top of the Arch was fantastic. Whereas some found this an exhilarating experience, others with claustrophobia or fear of heights were petrified. However, I was proud that everyone in the group went to the top. Some had to work hard to overcome their fears and considered this a “one and done” experience. Most would do it again. The views from the top were breathtaking. We could see for miles and miles in each direction. The sun was casting a perfect shadow on the Arch from the East so many of our westward facing pictures included the shadow of the Arch in them. It was a unique time of day to take pictures from the top of the Arch. After returning to the ground floor, many bought souvenirs, some sat and relaxed, and others meandered through parts of the Museum. Everyone was back at the Drury Plaza and ready to depart St. Louis at 10:45 AM. Thus began our journey southwest on I-44, parallel to Historic Route 66. I discussed Route 66 and how it was decommissioned in 1985 due to the completion of our Interstate Highway System. Today Route 66 is making a comeback but 15% of the highway is still in disrepair from neglect. I played Nat King Cole’s “Route 66.” Then, Dennis Blevins, one of our tour guests, volunteered to sing “Old Man River.” He took the microphone and in his deep bass voice, performed a beautiful heartfelt rendition for all of us. He received resounding applause. Dennis sings bass in many choirs and performs in shows as well. It was a very special moment. We stopped for lunch at the Cookin’ From Scratch Restaurant in Newberg, Missouri. The walls of the restaurant and adjoining shop were cluttered (in a good way) with antiques. They featured tools, cooking equipment, and signs from yesteryear. Route 66 signs and references were everywhere. The food was amazing. The specialty of the restaurant was their pan fried chicken and it was the best I’ve ever eaten; even better than the Amish. Comments I overheard from the passengers were that this was the best food so far on the trip. The owner, Tony, and the manager, Joy, were extremely welcoming. The service was excellent as well. This was Americana at its best. After lunch, I played the History Channel DVD, “Modern Marvels: Route 66” about the history and construction of Route 66. The passengers gained much insight into this route’s importance to the success of our nation through the 1950’s. We were 30 miles from our destination, the Hard Rock Hotel and Casino in Catoosa, Oklahoma when the traffic came to a sudden stop. Just ahead of us was a car smashed and wedged under the back of a truck. The police and fire fighters arrived and and 35 minutes later, we were once again on our way. However, one mile down the road, we came to another abrupt halt and just sat. Fifteen minutes passed before we began moving again, but at a crawl. The second accident involved two tractor trailers, both wrecked badly. We eventually reached the Hard Rock Hotel & Casino at 8:00 PM, an hour and a half delayed. The passengers were patient and wonderful as we listened to music, ate some cookies and muffins, and simply talked and laughed together. We have a very special group of people on this Cross Country Trip. And, Hank is a magnificent driver. We were met at the bus by Lindsay, the newly appointed manager of the Hard Rock Hotel and Casino. She was lovely as she presented me with the room keys and put a lei on every passenger as they stepped off the bus (you should have heard the jokes). We soon proceeded to our rooms and wished each other good luck in the Casino. The Hard Rock has made many improvements to their Hotel since last year. The rooms were modernized a bit since last year and they put in a huge pool adjacent to the health center with in-water lounge chairs, a hot tub, a fire pit area with comfortable seats around it, and large bar. The tour guests enjoyed their brief time here. We had a few big winners last night and everyone really enjoyed the Hard Rock Hotel & Casino. However, let it be known that it is easier to go through security at an airport than it is to get into breakfast at the Hard Rock Hotel. Not only do you have to hand in your breakfast voucher, you need to sign it and show them a picture ID. It took fifteen minutes standing in line before it was our turn to be approved to enter this sacred buffet. Luckily, the breakfast buffet was very good with a great assortment of foods including an omelet station. We were on the road fifteen minutes late as passengers were scrambling to finish their eggs and other breakfast foods (pun intended). I proceeded to present my “Who Killed JFK?” lesson as an introduction to the Kennedy Museum. I handed out the “Kennedy-Lincoln Comparison” sheet to each passenger and discussed the coincidences such as “Lincoln had a secretary named Kennedy and Kennedy had a secretary named Lincoln” and “Lincoln was elected President in 1860 and Kennedy in 1960.” I then discussed whether Oswald was the lone assassin. I presented the Zapruder Film that clearly shows that Kennedy was shot from the front, not the back. Most of the passengers had never seen this film and were shocked by the information presented. We had a very smooth ride driving into Dallas. As we entered the Dallas city limits, I (and I’m a Giants fan – go figure) led everyone in singing the Fly Eagles Fly song. Joe from our 2017 Cross Country trip and who led us last year sent me the words which I read as everyone sang. Since our version wasn’t sang as strongly as last year, it seems that the Eagles just might have a difficult time repeating as Champs (remember, I am a Giants fan). The passengers were dropped off with their map and restaurant guide of Historic Dallas in hand. Everyone enjoyed their choice of restaurant, did some shopping in the Wild Bill’s Western Store, and succeeded in being on time for their tour of the Kennedy Museum at the old Dallas Book Depository. 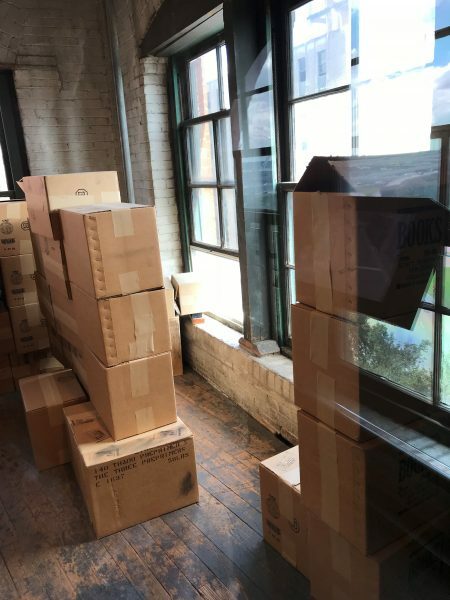 We were each given a smartphone size audio device and a set of headphones to guide ourselves around the 6th floor – the floor on which Oswald supposedly took the shots that killed JFK. The first Museum displays featured life in the early 60’s, JFK’s and LBJ’s campaign for the Presidency, and the major issues facing Kennedy both at home and abroad. Then the theme changed to that fateful day, November 22, 1963 and Kennedy’s trip to Dallas. The exact spot that Lee Harvey Oswald supposedly took his shots at the passing Kennedy motorcade is blocked off in plexiglass and recreated exactly like it was, with boxes all around the open window to hide him from view. 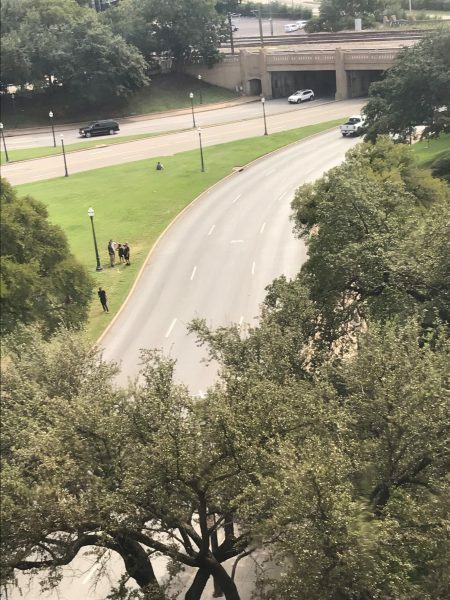 As you look down to Dealey Plaza from the nearby window at approximately the same angle Oswald had, you see a painted X on the road below at the exact spot Kennedy was shot. One soon comes to the conclusion that Oswald could never have shot Kennedy from the front, and if he did take a shot and hit him, the bullet would only go into his back. Which leads to the question, “Who really killed Kennedy?” This question continues to remain unanswered. The passengers really enjoyed the Kennedy Museum. Meanwhile, Hank was kind enough to take our luggage to the Holiday Inn Express. We drove to the Hotel and had an hour to freshen up before going to dinner at the El Fenix Restaurant. We all sat in two long tables and ate family style. The service was wonderful as two young ladies put a plate of crushed tomatoes, guacamole, sour cream, and cheese in front of each of us. Next came the rice and beans which we passed around. Finally, they served the chicken, steak, onions, and pepper platters along with the tortillas to share. We each made our own delicious fajitas. Today was an educational, emotional, satisfying, and very successful day. Breakfast was good. Prior to departure, we took time to celebrate Darcy’s birthday. Another passenger had party hats and birthday beads and we put them on Darcy and other passengers and took pictures off the bus. Once on the bus, Dennis, our fabulous bass singer, lead everyone in singing “Happy Birthday.” Not to outdo Dennis, Paul McCartney then sang his song “Birthday” to Darcy. Unfortunately, Paul was not able to be here in person. Darcy later shared with me it was the best birthday celebration she’d ever had, which touched me greatly!!! I played a few songs with a Texan theme and other songs from passengers’ requests and soon we were at our first rest stop in Bowie, Texas. This stop was pure Texas and Americana. The bathrooms were clean. The shop sold everything from leather goods, boots, Texan hats, ladies and men’s clothing, and food and travel items. We rode quietly for the next hour and a half until we arrived at our lunch stop in Vernon, Texas. This stop had something for everyone. Seventeen passengers chose to go to Walmart to shop and find something for lunch. Fifteen chose a fast food establishment on the other side of the highway. Hank dropped off and picked up in both locations. We had a little over an hour to have lunch and shop. Everyone enjoyed their time. Once we were back on the road, I played the fabulous movie, “Hidden Figures”. It took place in the late 50’s and early 60’s about three brilliant women working for NASA in Texas. 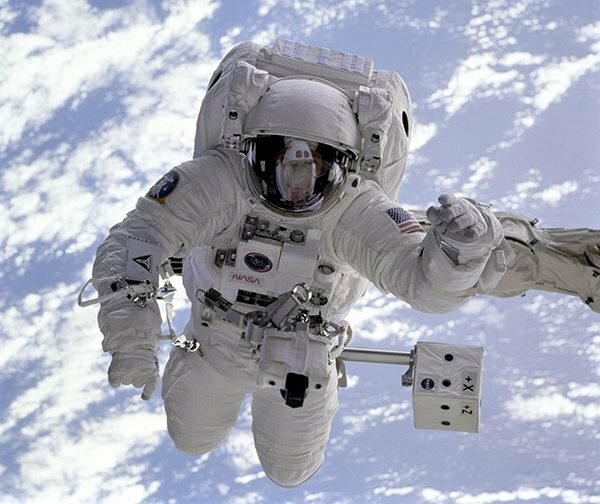 It depicts racial discrimination and how NASA overcame differences to get John Glenn safely into space and back in 1962. The movie is mesmerizing and breaks stereotypes in a positive way. Everyone enjoyed the movie and many praised it. We had a rest stop at the “Safety Rest Area” in Donley, Texas. It is a rest area “Texas Style” complete with a chuck wagon, “Living Out on the Range” information, and signs that say “Beware of Rattlesnakes.” We spent an extra ten minutes here taking pictures. Weatherwise, we had intermittent showers while on the bus and one heavier storm. Hank was grateful because the rain cleaned the bus and windshield of all the bugs. 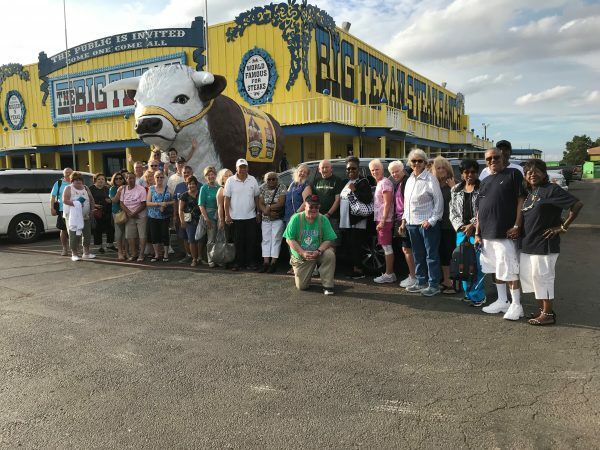 After a stop at our hotel, we arrived at the Great Texan Steak Ranch and I took a group picture outside in front of the giant cow. We were seated right up front, adjacent to the stage where contestants try to eat their 72 ounce steak along with 3 pieces of shrimp, a baked potato, a dinner roll, and a salad in 60 Minutes. If they succeed, they get their meal for free. If they fail, they pay $72. While we were eating, two young men accepted the challenge and both failed. A fiddler and guitar player came over to our tables and played requests such as “Deep in the Heart of Texas.” They also sang “Happy Birthday” to two of our passengers. I invited the musicians to join us for the remainder of our trip, but they made some excuse and sauntered off to another table. They don’t know what they are missing! Everyone was so thrilled to be experiencing this extremely informal Texas Style steakhouse. Passengers were taking many pictures and sharing many laughs. After dinner, everyone had an hour to shop for Route 66 and Texas souvenirs as well as explore the unique settings in which they could take funny photos in jail and on a large high chair. Everyone had a fabulous time. As a group, we have gelled into a friendly “family,” laughing and experiencing Americana together while traveling this great country. After a very good breakfast, we celebrated Ann’s birthday by taking birthday pictures outside the bus. Once on the bus, Dennis lead us in another rousing version of “Happy Birthday” and she requested Elvis’s “Love Me Tender” as her birthday song. Request accepted! 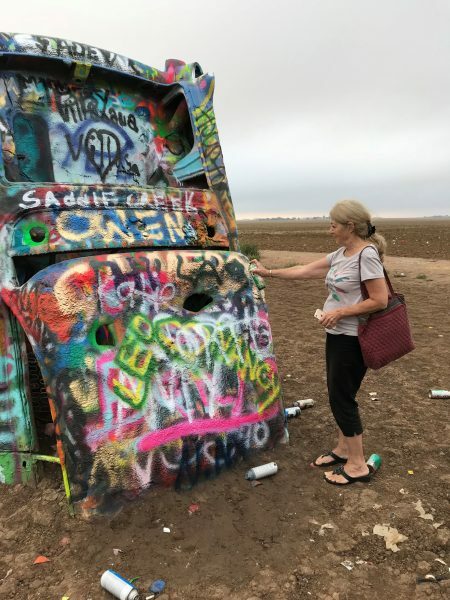 We departed another Drury Inn and drove to Cadillac Ranch. It is an artistic anomaly with 10 Cadillacs representing the years 1949 through 1966 planted front end down into the ground with the fins of the Cadillacs sticking high up into the air. It was created in 1974 by three hippies from San Francisco and a billionaire who funded the project and provided a piece of his own land for the project. Each car is spray painted in psychedelic colors and has been totally stripped over the years. There are spray paint cans lying on the ground to encourage onlookers to paint their own idea. We took a few nice pictures and were soon on our way. Our first rest stop was in New Mexico at the Welcome Center, just across the Texas-New Mexico border. It also marked the beginning of Mountain Time and turning our clocks back one hour. I encouraged passengers to gather a free color map of Old Town Albuquerque to use today. Many found free books and pamphlets on the state of New Mexico to their delight. As we continued driving through New Mexico, the skies were overcast with patches of sun. The terrain was flat and dry with a mixture of green and brownish vegetation. The land was becoming desert like. You could see for miles from all sides of the bus. One could almost picture cowboys on horseback galloping through this territory. Railroad tracks were adjacent and parallel to I-40 West off the right side of the bus and soon we saw endless freight trains rolling down the track pulled by Diesel engines. We counted three different long trains in all. I played some Johnny Cash, John Denver, and a few other songs. Many people were tired so the bus remained quiet until our final 15 minute rest stop, 90 minutes from Albuquerque. Hank did a great job driving through New Mexico. We arrived in Old Town Albuquerque and everyone was happy to spend two hours exploring this pretty section of town. The maps provided were extremely helpful. There were numerous shops selling gifts, jewelry, hot air balloon replicas, and clothing. Many fine restaurants lined the Town as well. The architecture of the buildings was Spanish adobe style with light brown colors. The passengers shopped, walked, and ate lunch. They really enjoyed their time in Old Town Albuquerque. 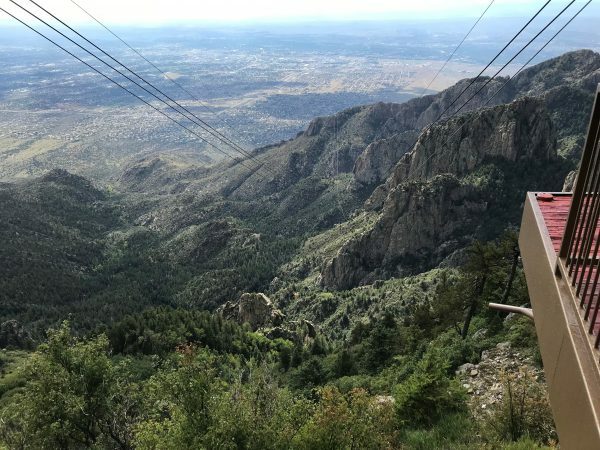 We then drove to the entrance of the Sandia Peak Tramway. When I arrived at the ticket counter, there was an announcement that lightening was sighted at the top of Sandia Peak and the tram was temporarily closed until the lightening passed by. Thirty minutes later, the lightening passed and the tram reopened. All but one of us boarded the Tram as we crowded close together for the fifteen minute ride to Sandia Peak. The skies had miraculously cleared and the sun was shining brightly. The views were breathtaking. We were traveling 12 miles per hour up the mountain. As we go up, another Tram goes down which creates a gravitational pulley system. The ropes and overall system is tested and checked every day. The Tram Cars are replaced every twenty years. The Drury Inn Albuquerque was ready for us as we arrived and everyone was on their own after getting settled in. A large majority of our group took advantage of the Kickback for complementary drinks and dinner foods. Many were excited about the Eagles beginning their season tonight (airing at 6:30 PM Mountain Time on NBC). Another wonderful day. The Savory Bakery delivered our wonderful boxed lunches and with the assistance of Carmen, one of our helpful passengers, I put each person’s choice of sandwich on their seat in a timely manner. The weather was gorgeous, crystal clear blue skies and mid 70’s temperatures, as we drove away. 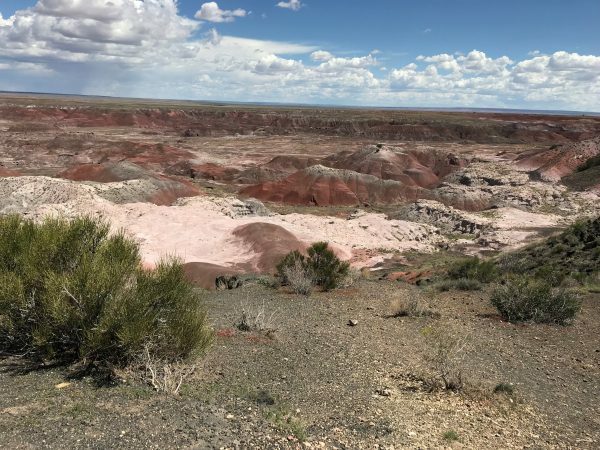 I reviewed the details of our itinerary and played a video detailing the formation of the Painted Desert and Petrified Forest. It contained many scientific facts and the passengers seemed to enjoy learning about it. Then I played the Western that won John Wayne his only Oscar, “True Grit,” also starring Glen Campbell and Kim Darby. Again, many really enjoyed this. We have a lot going on with rest stops, time changes, and Port of Entry stops. The Navajo and Loves Truck Stop Rest Area is the best rest stop of our trip. The Navajo Center has some of the lowest prices on blankets, turquoise jewelry, and New Mexico and desert souvenirs. With the blankets from Mexico costing only $4.99, many passengers including Hank and I had no choice but to buy one, whether we needed it or not. We continued west for 16 miles and entered Arizona. Our electronics jumped back one hour once again. We were now in the Pacific Time Zone and will remain in this zone for the next 12 days. A few more miles west, we entered the Port of Entry for Arizona. Hank had to bring all of the paperwork from the bus into the building where Arizona officials registered us and issued a permit. Continuing west another 45 minutes landed us at the Visitor’s Center in the Painted Desert Petrified Forest National Park. We used the restrooms, many bought memorabilia, and we received a short newspaper with information about the Park. We began our 26 mile drive through the Painted Desert. I was now the Local Guide for this beautiful park with its scenic vistas and iron, manganese, and gypsum soil. It’s these three elements with varying degrees of oxygen that create all the colors of the rainbow in the rock formations and soil. We stopped at the Kachina Point Overlook and got our first breathtaking glimpse of the Painted Desert. After fifteen minutes, our next stop was Chinde Point where we found our picnic tables and ate our lunch. After lunch, I devised a fun auction to give away 11 prizes from the generosity of Starr. I want to thank Mary and Jacque, two passengers, for doing a great job in running the auction. Every passenger received a piece of paper and wrote their name on it. Then, a prize was described. If a passenger was interested in that item, they put their name into a hat. One name was then called and the winner received the prize. The winner was now eliminated and could not put their name into the hat again. Papers were given back and then the next prize was introduced and interested passengers put their name into the hat once again. A winner was drawn and the prize was awarded. This went on until all 11 prizes were given away. The passengers all loved this. We continued south and headed into the Petrified Forest. We stopped at three overlooks. The first, Newspaper Rock, depicted petroglyphs on rocks from thousands of years ago. The second was Agate Bridge. We saw a huge (reinforced) petrified log that spans across a water gap. 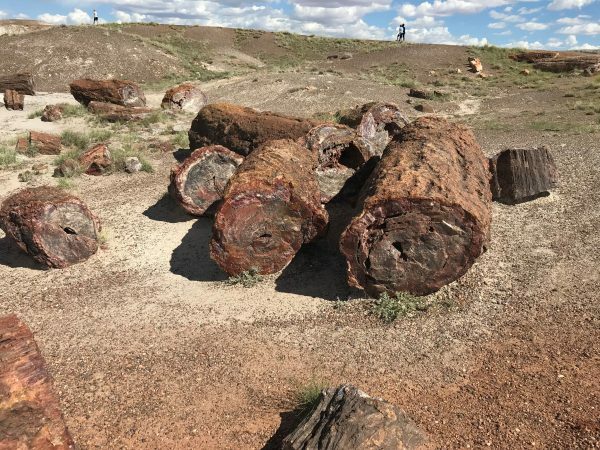 The third stop, Crystal Forest, is the place where 15 of our passengers braved the warm sun and high elevation (5,826 feet) to complete a .75 mile hike into the back country of Petrified Forest National Park. We were surrounded by magnificent pieces of Petrified Logs, all sparkling like multicolored crystals. There are Petrified Logs as far as the eyes can see. The amazement and beauty of this area was appreciated by all the passengers. Our final stop was the Rainbow Forest Museum & Visitors Center on the southern end of the Park. Passengers were able to view a video on The Painted Desert and Petrified Forest, use the restrooms before our upcoming 90 minute trip to Flagstaff, and browse the gift shop. Hank drove the final 75 minutes into Flagstaff, Arizona, gateway to the Grand Canyon, and after checking into the Holiday Inn, passengers were on their own for the remainder of the evening. This was another perfect day. I discussed a few facts about the Grand Canyon and the Harvey Girls and played a DVD telling about the history of the Harvey Girls. Before the documentary ended, we were entering Grand Canyon National Park. We parked at the Desert View overlook and it was here that the passengers caught their first glimpse of the most magnificent view they will probably ever see. The sun was being absorbed into brilliantly colored rock formations reflecting a magical illusion back to our eyes. It looked like a huge multicolored mural that an artist painted with water colors. I always say that seeing is believing and seeing the Grand Canyon creates an unbelievable sense of beauty beyond anyone’s imagination. Comments from our passengers included, “I can’t believe this,” “I’ve never imagined anything so magnificent,” “it doesn’t look real,” and “WOW.” For me, once again my sensitivity came through and tears wet my eyes. I was back home! We met our local guide, Cowboy Bob, and began our two hour tour. Bob was extremely passionate about the Grand Canyon and showed us so many fabulous secrets as we stopped at different overlooks. At one overlook, Bob pointed out holes in the Canyon Walls that were carved by Native Americans who once lived there. Whenever an invasion was suspected by another tribe, they would move their wives and children into these holes for protection. Today, these holes are probably homes for bears. At one stop, Moran Point, named after Thomas Moran who was a landscape artist at the Grand Canyon, Cowboy Bob pointed out four amazing sights: 1. a series of formations that took the shape of a Battleship, 2. another formation that took the shape of a sinking ship, 3. a view of the swiftest and most dangerous rapids on the Colorado River registering a Class 8 on the 1 to 10 scale of rapid rating (with 10 being the most difficult), and 4. Bob pointed out that certain rock exposed at this overlook was Vishnu Shiest dating back 2 BILLION years, the oldest layer of rock known on Earth. Cowboy Bob was extremely informative and very funny with a wonderful personality. 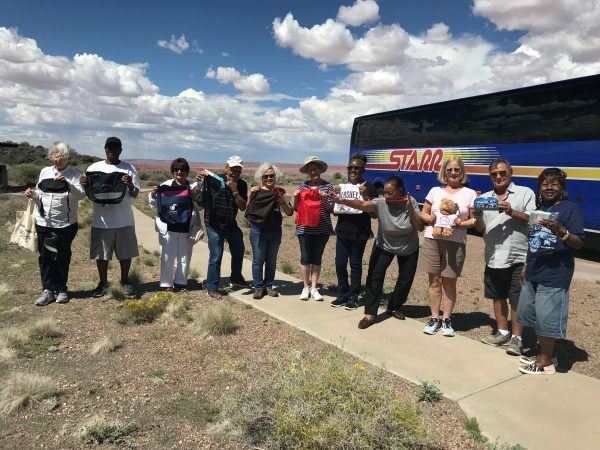 Following the tour, the passengers were on their own at the Bright Angel Lodge in Grand Canyon Village for lunch, shopping, and the opportunity to walk the rim of the Canyon. We had two hours to eat and explore this section. Some ventured down the Bright Angel Trail for a short distance to experience the Canyon from within. The Trail is one of two trails that leads hikers all the way down to the Colorado River. Others shopped in the Gift Shop desiring to bring memories of the Grand Canyon home. But no matter what activities we chose to do, we had the time to experience the Grand Canyon in our personal ways. Once back on the bus, we proceeded to the General Store for another half hour of shopping. 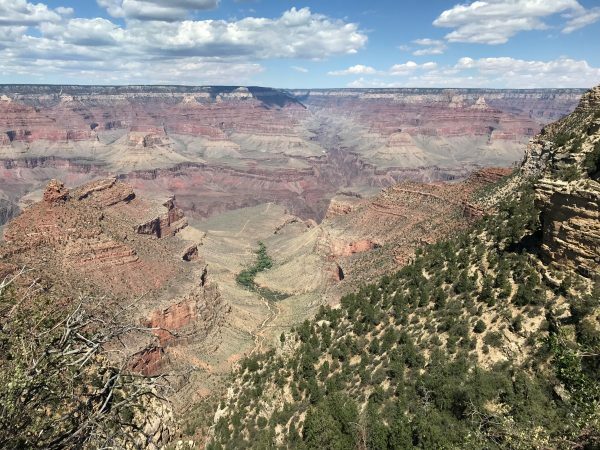 Our final stop for the day was the new Visitors Center Complex along with a short walk out to Mather Point Overlook and another spectacular view of the Canyon. It has been a long productive day with absolutely perfect weather with temperatures in the mid 80’s. All the passengers were fully content as we said our goodbyes to the Grand Canyon. The shadows and sunlight paint a different portrait on the Grand Canyon from hour to hour and overlook to overlook. The magnificent views never look the same from moment to moment. This is one of the qualities that makes the Grand Canyon so unique, thus earning it the distinction of being one of the Seven Natural Wonders of the World. We arrived in Flagstaff and the passengers were now on their own for the remainder of the evening. Today was another spectacular day. We had another nice breakfast at the Holiday Inn Express. As we were leaving Flagstaff, Dennis shared his thoughts on the grandeur of the Grand Canyon and sang an amazing rendition of “America the Beautiful.” His magnificent baritone voice resonated throughout the bus. He received a rousing sitting ovation (the bus was moving). We traveled Route 89A, the narrow winding road bringing us down 2000 feet into the beautiful red rocks town of Sedona. 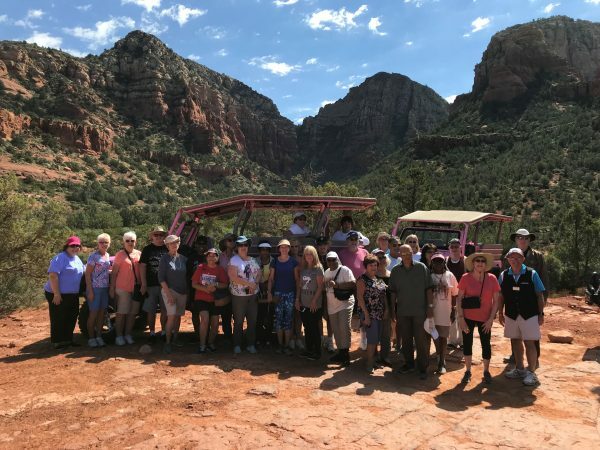 Shortly after our arrival in Sedona, Pink Jeep Tours took us for an exciting ride into the back country among the beautiful mountains – riding over large rocks, the famed Red Dirt of Sedona, and 30° inclines. The ride was bumpy and gently swayed us from side to side. The wonderful drivers made the experience exciting enough for each of us to get the sense of the rugged conditions of riding in the back country while keeping it gentle enough for us to thoroughly enjoy it. Following the ride, we had two hours for lunch and shopping. I gave everyone a fun challenge to eat at Cowboy Bills and try the Appetizer Sampler. 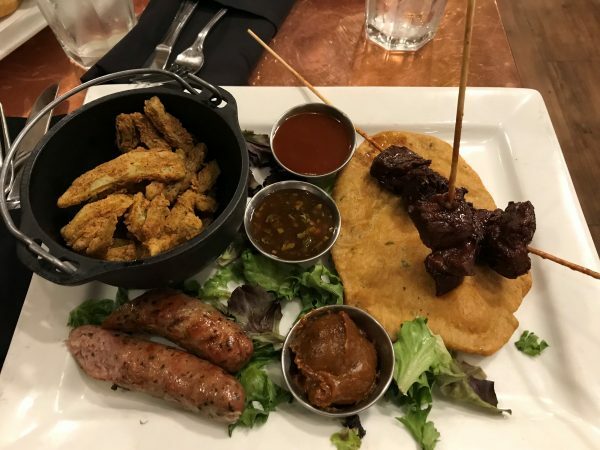 This plate consists of buffalo meat, cactus fries, and RATTLESNAKE sausage. And to my great surprise, 21 ate at the restaurant and 15 tried the rattlesnake sausage. All were happy they tried it and they had so much fun in the process. Lunch was a treat. It’s always fun to peek into the Western Stores, the fine boutiques, and the souvenir shops on both sides of Main Street in Sedona. It’s designed in a western setting and the views are just spectacular. The stretch of highway from Sedona to Las Vegas, has no rest stops and no civilization. The first rest stop is at Exit 66 in Arizona, over three hours away. I kept the passengers occupied by first reviewing everything in their Las Vegas bag including my 11 page Las Vegas booklet. Then I showed the History Channel’s Documentary on Las Vegas, a 50 minute DVD. And finally, I played the 85 minute movie that was filmed in 1964 starring Ann Margaret and this singer from Memphis by the name of Elvis, “Viva Las Vegas.” It was an oldie but a goodie and was a perfect choice to set the mood for our two nights in the “Adult Playground.” So when we arrived at the Petro Truck Stop featuring a Duncan Donuts, we took 30 minutes to stretch our legs and shop in the store. The Hoover Dam, originally named the Boulder Dam, lies at the border of Arizona and Nevada on Route 93 North. So as we approached the Dam, I announced to the passengers to have your cameras ready and look to your right. Hank slowed down the bus as we passed the Hoover Dam so we were able to take pictures. It is a powerful sight to behold with the solid concrete structure holding back mega gallons of water (Lake Mead) with what appears to be hundreds of electrical wires extending in all directions. One of the options for tomorrow is a five hour Tour of Hoover Dam. My GPS along with my memory of the area helped Hank navigate the bus right into the unloading section of the New York New York Hotel. The porters were waiting for us and before I was able to return to the bus to hand out the keys to the passengers, the luggage was gone. I wished everyone good luck and told them to call me anytime if the need arose. They were now on their own until Tuesday morning at 8:00 AM. After getting settled in my room, I met 8 passengers who wanted to see a Las Vegas show and guided them over to the discount ticket booth by the MGM. To my utter dismay and horror, I learned that the Beatles “Love” was now dark on Sundays and Mondays. The passengers laughed as I cried (all in fun), but we were all disappointed as I had built up the show. The ticket agent said “Love” had switched its dark days in June. GROAN!!!!! Instead, we were able to purchase tickets for Michael Jackson’s “One” by Cirque du Soleil for the 9:30 PM show that evening. Six of us bought tickets and made our way over to the Mandalay Bay by walking over two bridges and taking a free tram. The show was very good. The special effects and acrobatics were a bit weak at first but really picked up later in the show. The Michael Jackson music was boooooming and you felt the vibrations throughout your body. I loved it. The visual effects were constant and came at you from all angles. It was a show that penetrated your being and expressed Michael Jackson’s music as well as his unpredictable and confused persona. I thoroughly enjoyed the entire experience as did Carmen, Cindy, Donna, Lina, and Sal. We made our way back to the New York New York and went our separate ways. Craving a slice of New York pizza, I had a delicious midnight snack before turning in. Saw “Vegas, The Show” at An Old-Time Vegas review featuring acts from the 1940’s to the 1990’s including the Casinos that are no longer around. Enjoyed my comfortable bed, the relaxing pool, great fitness center and equipment at the New York New York. The fitness Center also provided free fruit. The whole experience of Vegas is wonderful. Exploring the inside of the Casinos during the day and walking The Strip at night was the way to go. The Venetian was my favorite. My legs almost gave out. RENEWED OUR WEDDING VOWS in the Chapel at the MGM. Today was Jacque’s birthday so we began the day on a happy note with Dennis once again leading us in singing “Happy Birthday” to her. I also wished all of our Jewish passengers a healthy and happy New Year on this Rosh Hashanah morning. Before the bus pulled away from the New York New York, I lead everyone in a moment of silence to honor the 3000 who lost their lives 17 years ago. As Hank guided us outside of Las Vegas onto I-15 South towards Los Angeles, I reviewed the horrendous events that took place in 2001. Afterwards, I played Neil Young’s song, “Let’s Roll” to honor Todd Beamer of Cranbury, New Jersey who, with others, stormed the cockpit of Flight 93 and gave their lives to prevent another disastrous attack. Our first stop was at the Calico Ghost Town, an old silver mining town in Nevada that was active from 1881 to the middle 1890’s. The buildings have been resurrected in their exact same place as they were in 1881. The passengers enjoyed exploring this little town. We arrived at the Sportsman’s Lodge in Studio City, California earlier than our itinerary suggested. Hank continues to do an outstanding job driving the bus and the traffic into the Los Angeles area was surprisingly light. The weather continues to be perfect. Some passengers took advantage of the beautiful pool that sits in the center of the hotel. It also has a swim-up bar and serves food. Others were so tired that they retreated to their room. Some went out to a nearby restaurant for dinner. We are all anticipating tomorrow’s tour of the great city of Los Angeles. There was excitement in the air as Judy Parisi, our local guide and expert on everything Los Angeles, introduced herself to everyone. Judy is extremely outgoing and friendly and has a deep passion for her city. Ironically, Judy is from Passaic, New Jersey and moved out here 25 years ago. We first traveled to the Rockefeller Center of Los Angeles, Graumans Chinese Theater, now named the TCL Chinese Theater. Judy showed us the infamous Hollywood Sign on the hill in the distance. Then, she spoke about the Dolby Theater, the Red Carpet, the Academy Awards, and how workers cover all the shoppes with fancy curtains so that viewers of the Academy Awards don’t realize the Dolby Theater is actually in a giant mall. Judy then led us down the Red Carpet steps (I don’t understand why officials did not put down the Red Carpet for us) and out to the Walk of Fame. Judy told a story about how Shirley Temple, at age 6, didn’t want anyone to notice she had lost a tooth so to take attention away from her face, she defied the rules and put her little feet in the cement, thus starting a new tradition. Stars became creative after this. Jimmy Durante, for example, put his nose print while George Burns stuck a cigar into the cement. The only couple together in one section of cement is Joanne Woodward & Paul Newman. 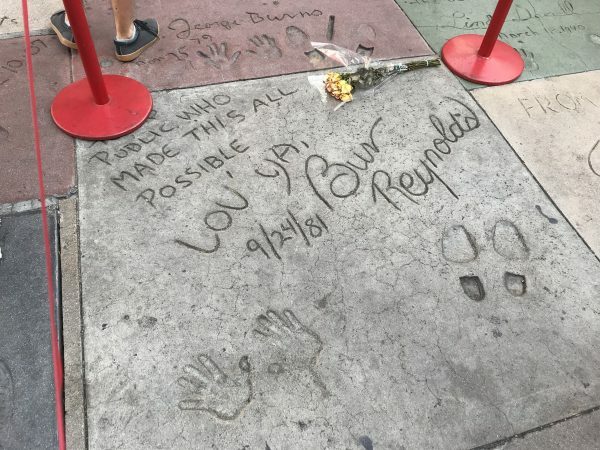 A flower was placed at Burt Reynolds square who recently passed away. The Tour continued as we drove past the Chateau Montmarte where John Bellushi died and the Vipor Room where River Phoenix died, the Rainbow Bar & Grill where Marilyn and Joe first dated, and famous landmarks such as the Beverly Hills Sign, the street the Clampetts drove down in the introduction of the Beverly Hillbillies, and the Jewelry Store on Rodeo Drive (we were not allowed to drive on Rodeo Drive) in which Julia Roberts was thrown out in the film, “Pretty Woman.” We also traveled on Santa Monica Boulevard and Route 66. Route 66 ends some 20 miles west at the Pacific Ocean. We had two hours for lunch and shopping at the famous Farmers Market. Many tried the Corned Beef sandwich at famed Magees Kitchen. Blanche Magee opened the original sandwich shoppe that started a new trend. Originally, the Farmers Market was a place for local farmers to sell their products, paying 50 cents a day for the privilege. Mrs. Magee thought they might like to have lunch, so she filled a picnic hamper and started feeding them. After Magees opened, more entrepreneurs followed. Today there are over 80 eating establishments in the Farmers Market, not including the modern shops at the Grove, a single level mall adjacent to the property. We continued our tour into South Los Angeles passing a school that was once the Ambassador Hotel in which Robert Kennedy was shot. We were shown Los Angeles’s City Hall Building that was used as the opening of the Adventures of Superman episodes in the 1950’s. Judy explained the creation of the new Disney Theater Complex and the location of the Staples Center, home of the LA Lakers and LA Kings. Judy, our Tour Guide, was absolutely magnificent and told me she actually trained Chris, our Los Angeles guide from 2017, who has since left the company to pursue a career in voice overs. We arrived back at the Sportsman Lodge to drop off Judy and 4 passengers who chose to relax rather than go to the Universal Citywalk. Hank and I gave the passengers 3 hours for dinner and strolling around. Everyone enjoyed this opportunity in the beautiful Southern California weather. Five of us ate at Bubba Gumps for the first time. The food was delicious and we all enjoyed each other’s company. We arrived back at the Lodge tired and fulfilled with another perfect day. We packed up and drove out of Los Angeles at 8:00 AM and battled the rush hour traffic on The 101 until we were considerably north of LA. I played a few wake up songs and then, to the total enjoyment of the passengers, showed the first two episodes of the Beverly Hillbillies. We arrived at the Santa Barbara Courthouse and eventually met our guide, Mike. The Santa Barbara Courthouse is a magnificent structure with Spanish and Moorish architecture. Brilliant artwork, open corridors, and massive hallways with high ceilings strike the visitor. Court was in session. An older, unshaven man locked in shackles was being escorted by an officer past our group. Women and men dressed in formal attire (most likely attorneys), were scurrying either into one of the many courtrooms or the huge Library to do their research. The guide spoke about the history and decor of the building. The hour passed quickly. We were soon on our way to the equally magnificent Santa Barbara Mission. Missions are places of worship and sanctuary. Twenty-one missions were built from San Diego to San Francisco from the late 1600’s to the early 1700’s to provide a place for weary travelers to stay and to spread Christianity throughout California. Our passengers were able to complete their own guided tour at their own pace. Signs were strategically posted at every turn showing us where to walk. We saw a 10 minute introductory film in a small theater before strolling the hallowed grounds. We saw the mausoleum that continues to add to their numbers today (for a minimum of $30,000). Many passengers reflected for a short time in the large beautifully adorned church. 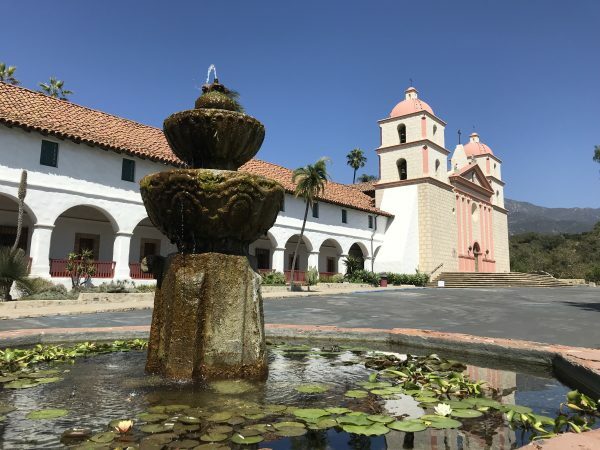 Finally, we passed through the museum telling about the history of the Santa Barbara Mission as well as the lifestyles of the people living back then. It was a calm and serene visit, a distinct contrast to the busy Courthouse. We traveled about 45 minutes north to the quaint Danish community of Solvang, with a population of about 7,000. With Scandinavian decor that included a large windmill, the passengers had about 20 food establishments to choose from and many different shops to walk into. Once again, our weather was perfect to walk outside with temperatures in the upper 70’s and clear blue skies. We had two hours in Solvang and everyone enjoyed this unique Viking village. We traveled to San Luis Obispo and another Holiday Inn Express. The rooms were beautiful with brand new carpeting and wonderful amenities. After settling in some passengers left the hotel to explore San Luis Obispo. Many took the $.25 trolley into town to enjoy the Thursday Night Market and all of its food and entertainment. Some grabbed a light Italian meal or pizza across the street at Gino’s, and went back to their room. It was a productive evening and another wonderful day. This morning, we traveled to the magnificent Hearst Castle in San Simeon. I played a few morning songs and talked about the day. I then showed the A&E Documentary on Hearst Castle which proved to be a great introduction to the life of William Randolph Hearst. We arrived at the Visitors Center of the Hearst Castle and I effortlessly got the wrist bands and gave one to each passenger, including Hank. I lead our group into the theater where we were treated to a 40 minute movie on the life of William Randolph Hearst. This film focused on the building of the Hearst Castle and the life experiences that young William had that influenced its furnishing and architecture. It was a great introduction to the Castle we were about to experience. We rode the school bus to the top of the mountain where we were met by our knowledgeable tour guide. We then climbed many steps to different levels until we reached the Castle. One of our handicapped passengers was placed on the ADA bus and driven to the Castle from the school bus drop off point in a golf cart. Beautiful views, unbelievable architecture, and magnificent decor were the theme of the day. Tapestries hung from many walks. Statues stood proudly in their place. Elegant furnishings were strategically placed in each room. Hearst created a castle fit for European Royalty in a location that defied imagination. We descended the mountain and ate lunch in the Visitors Center. We were soon on the bus and departing for a quick stop at the Elephant Seal Rookery. Before we arrived at the beach where these magnificent creatures crawl onto in order to molt, or shed, their outer skin, one passenger was extremely upset that she had left her camera back at the Hearst Castle Visitors Center. After staring in amazement at these fascinating Elephant Seals lying on the beach and rarely moving, we drove back to the Hearst Castle and fortunately retrieved the camera. We were now on our way to San Francisco. Hank and I chose to follow both of our GPS directions that took us on the Pacific Coast Highway, Route 1. Hank did a marvelous job steering the bus through the many twists and turns of this two lane mountainside highway. The passengers relished in the absolutely magnificent scenery of the rugged Pacific Ocean, aqua in color, laden with beautiful rock formations and high cliffs. I played soft, calming music such as Lionel Richie and Johnny Mathis to keep the passengers relaxed as the bus ascended and descended the mountains for 60 miles. The passengers were very happy to have experienced the Pacific in all its glory. At the end of Route 1, we arrived in the city of Carmel where Clint Eastwood was once the mayor. We found a shopping center with public restrooms and took a fifteen minute break. Once back on the road, I reviewed my San Francisco packet with all the different opportunities for tomorrow afternoon in San Francisco. 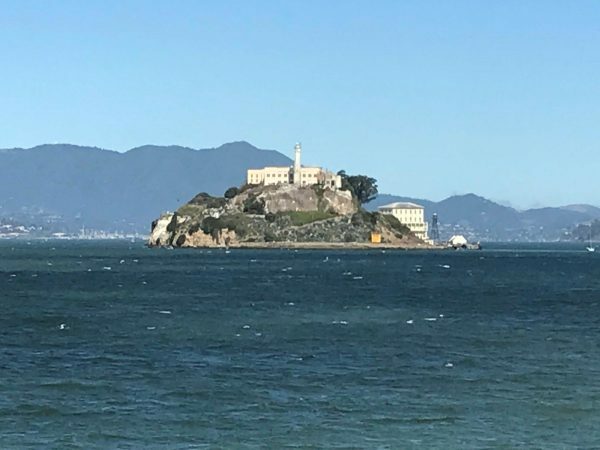 I also discussed our walking together to the Alcatraz Pier 33 in the morning, and that I would get a cab for those passengers wishing to ride (I sent a sign up sheet around). We had 8 passengers riding. I then put on the movie “Citizen Kane,” the 1941 drama about the life of William Randolph Hearst created and starring Orson Welles. The passengers enjoyed this very much. Once we reached The 101 North leading into San Francisco, we were in bumper to bumper traffic for 50 miles. We found out there had been a bus fire closer to San Francisco that forced the road closure. The road eventually opened. With all of our delays, we finally arrived in San Francisco at 7:20 PM. The Hotel Zephyr was ready for us. I was given our keys and Hank and the Porter were removing the luggage. Soon the passengers were free to go to their rooms and get a quick bite to eat in one of San Francisco’s fabulous restaurants. It was a very long day, and extremely memorable. The weather was sunny and 60° and visibility was clear as we boarded the ferry to Alcatraz Island. Once on the ferry, we were able to get beautiful pictures of both the San Francisco-Oakland Bay Bridge as well as the majestic Golden Gate Bridge. Fifteen minutes later, we had completed the 1.25 mile span between San Francisco and The Rock. We learned that more than 5000 visitors a day make this trek. The large crowds are extremely well managed, kudos to our National Park Service. Once we arrived at the Penitentiary we were handed headphones and an iPod-like device that provided step by step directions and historical information about each section of the prison with amazing sound effects that made you feel like you were right in the middle of the action. We were guided through Cell Block D also known as solitary confinement and jail cells with specific stories attached to them. Posters hung on the walls with facts on famous inmates and guards while still more posters explained breakout attempts. We were guided outside into the Recreation Yard, and finally into the Dining Hall. It took about an hour to complete the tour. We were now on our own for the remainder of the day. Some stayed longer on Alcatraz Island while others took the ferry back earlier to make a timed tour in the afternoon. Some passengers went to Muir Woods, others hopped a trolley and rode around the city. A few took a tour of San Francisco by bus while others simply followed a map and walked. San Francisco has hills like no other city I know. My plan was to see the famous Lombard Street, and Hank decided to walk with me. So up we began climbing, one block, two blocks, panting instead of breathing. Only three more excruciating hills to go. We saw a trolley easing its way up the huge slopes and hopped on and got off three blocks later at Lombard Street. 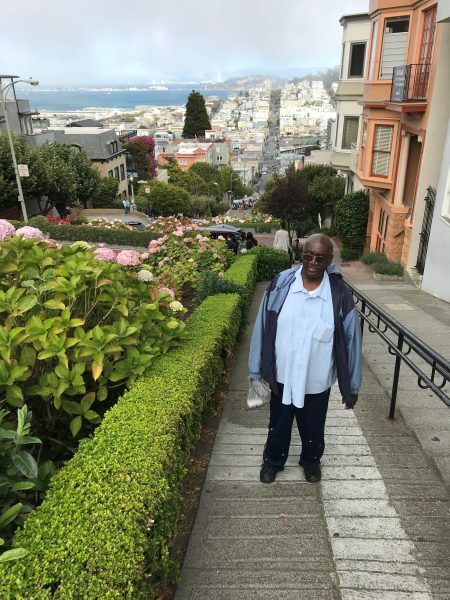 After a few amazing pictures (Lombard Street offers beautiful views of Nob Hill and other sections of San Francisco as well as its winding, steep slope), Hank and I hopped on another trolley to take us back down to bay level. San Franciscans are extremely fortunate that they never have to deal with snow and slippery roads. It was a fabulous day in San Francisco. Everyone enjoyed their multitude of experiences. Tomorrow morning, we leave our hearts. 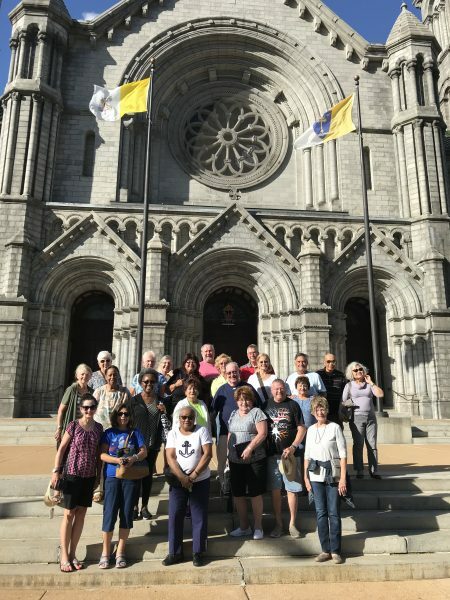 Click here to see more photos from this fabulous tour! 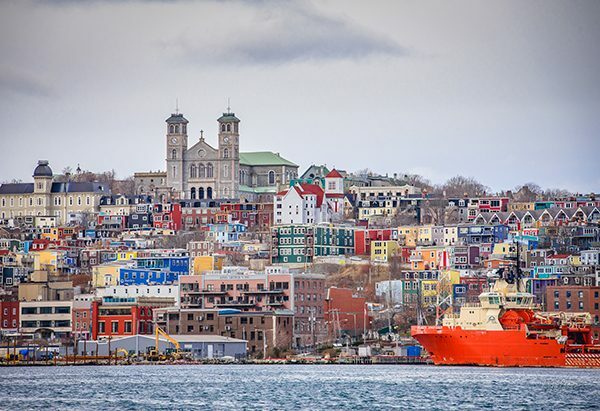 Join in on the fun on our BRAND NEW Cross Country Trip in 2019! How it is that I feel like I just took out my white pants, when in reality Memorial Day was 2 months go? How is it that our (first and last) family-day-at-the-beach is planned for Labor Day Weekend, just a few days from now? Summer has flown by! But it’s no surprise – time flies when you’re having fun. Can we ever slow it down? You can’t look for ponies on Assateague Island on an empty stomach which is why we stop for lunch at Phillip’s Crab House in Ocean City. Sure looked like the group was enjoying their meal. Glad the weather held out for them, too! Starr Tour Director Angie made sure the weather forecast was looking good! 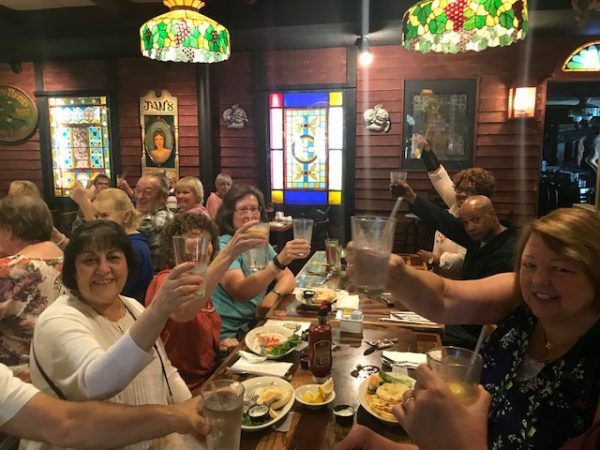 Tour Director MaryAnne and Driver Bill (also MaryAnne’s husband) had a great time on their trip to Cape Cod. This shot shows 40 happy hands in the air at the National Seashore. 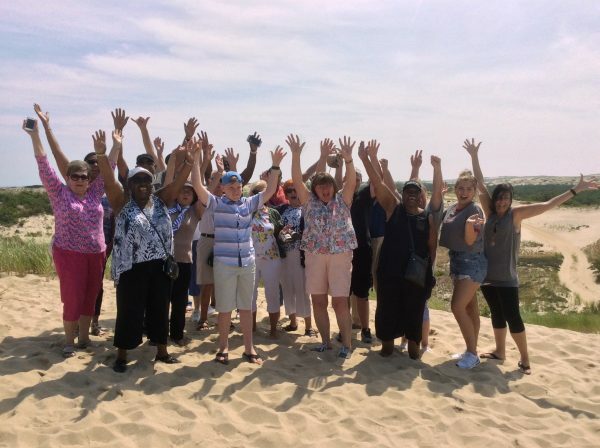 Our fabulous tour guests loved Starr’s new hotel and the Dune Riding Tour was the favorite activity! 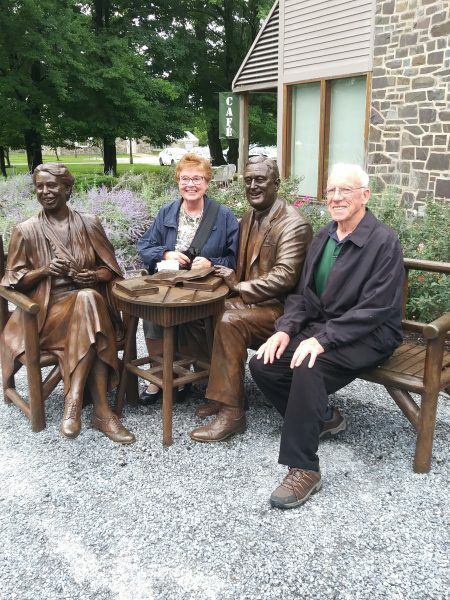 Our 3-day Bus Trip to New York’s Hudson Valley stopped for a visit to FDR’s Hyde Park home where Tour Director Bette snapped a photo of these two lovely couples: Franklin and Eleanor Roosevelt and two happy Starr bus tour guests. We also stopped at West Point, a Winery, Innisfree Gardens, Vanderbilt Mansion and did a Boat Cruise. It was a busy but memorable trip! 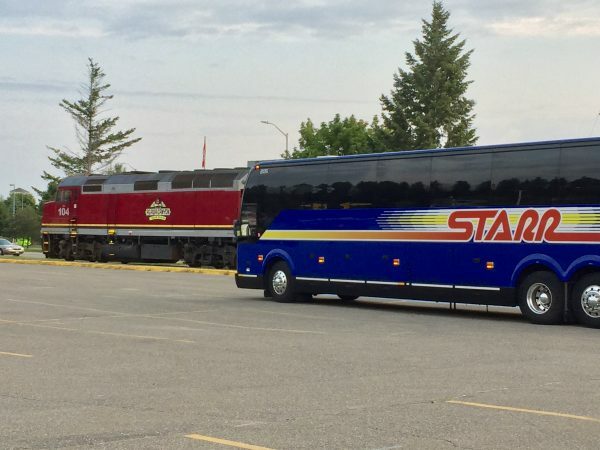 For the first time in many years, we operated a bus tour to the American side of the Falls – where you don’t need your passport. 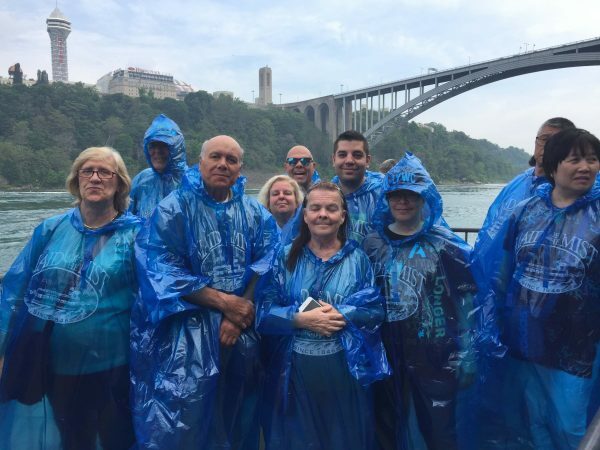 These (thankfully) dry Starr travelers had a wild time on the Maid of the Mist Boat Cruise with their Tour Director Karen. On this Niagara USA bus trip we wanted to make sure our tour guests got up close and personal with the Falls! 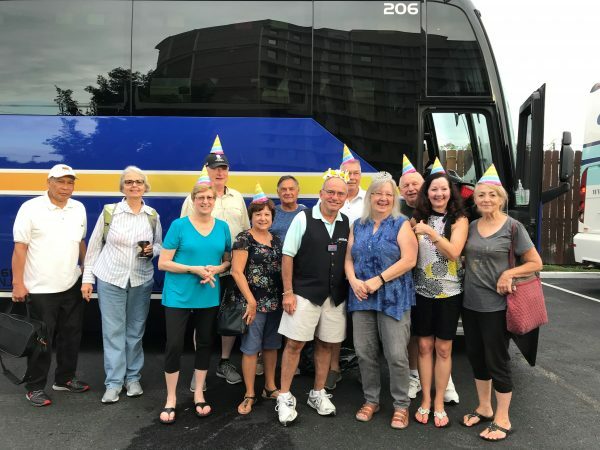 The feedback was very positive for this first-time tour itinerary and the tour guests loved staying at the Seneca Niagara Casino Resort! 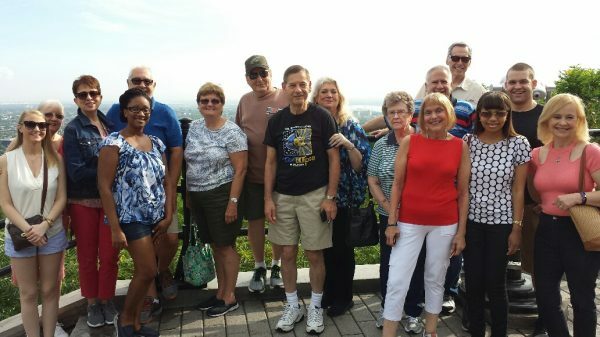 Penny Rudolph, Starr Tour Director and resident photographer, took this wonderful group shot on our August trip to Quebec City and Montreal. Our Canadian neighbors welcomed us with open arms and warm hospitality. Boy the Hilton Quebec City is magnificent and in a great location! 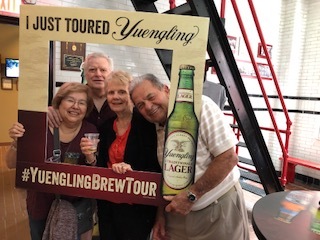 Summer heated up with Christine Durling and her tour guests on this trip to the Yuengling Brewery and Jerry’s Classic Cars & Collectible Museum. We tasted some beers at America’s Oldest Brewery and then relived the past at Jerry’s with over 20,000 interesting items! What fun! So as you can see, the summer flew by but here is an example where Starr tour guests stopped to take care of themselves. They treated themselves to a wonderful vacation that delivered memories that will last much longer than our short 2 month summer! Don’t let the fall pass you by, we have lots of bus trips to choose from! What memorable trips did you take this summer? Great Adventure’s Safari Tours are a common snapshot in the family vacation albums of many families in the tri-state area. From 1974 – 2012, visitors to the safari park had the freedom to drive their family vehicles through the wilds and have up close and personal (at times very personal) experiences with the animals. Chances are you or someone you know has a story about the time the giraffe stuck its head through their sunroof, or the time the chimps climbed up on top of the car and stole their windshield wiper. These stories are a part of Starr’s history, too! The motorcoach in the picture is parked in the hospitality area of Great Adventure. It’s #116, one of 6 sister coaches purchased in 1988 – with a 49 passenger capacity and onboard lavatory. The shuttle service began as a solution to the problem some Great Adventure customers encountered when the chimps in the safari started tearing up and eating the vinyl roofs and other parts from personal cars that drove through the park. For a small fee, customers who did not want to take the “Baboon Bypass” to spare their own fragile cars, could ride on safari shuttle buses through the park and avoid possible damage to their vehicles. We typically sent our older buses to run the Great Adventure Safari Shuttle because of the threat of damage by the animals and the off-road route they had to travel through the safari. The monkeys often tore off the bus’ wipers and ate the marker lights so we had to replace the plastic lenses with glass ones in order to stop the damage. Alan says there was other monkey business that occurred, too, but it’s “too dirty” to talk about in this post. On personal vehicles, over 100 vinyl tops were torn off daily and Alan recounts watching cars finish the safari trip with only bare grey metal left on the cars’ roofs. Thunderstorms were another challenge as the safari tours ran rain or shine and the storms would often get the animals excited. Alan recounts that there were several lion and tiger attacks on the bus’ front tires and adds that breakdowns in the middle of the safari were an “adventure” for mechanics and drivers! Alan’s wife, Renee, recalls many a summer weekend when he would be away from home tending to his dispatch duties at the park. When Great Adventure, now Six Flags Great Adventure, ceased allowing personal cars to ride through the safari in September of 2012, the decision was met with nostalgic regret and hopeful relief. It was the end of an era for many who fondly recalled the “great adventure” of driving through the park and making memories with their family and the animals. While for others, it was a shift in the right direction for the welfare of the animals. Today, Six Flags still operates a safari park with the Safari Off-Road Adventure included in the price of general admission and visitors get to ride in rugged off-road vehicles specially designed for splashing through ponds, climbing hills, and over rugged terrain as they traverse the 350-acre preserve. What’s your favorite memory of Great Adventure’s Safari? Share it in the comments section!